INGREDIENTS/INGRÉDIENTS: WATER/AQUA/EAU, MICA (CI 77019), ALUMINUM CALCIUM SODIUM SILICATE, CALCIUM SODIUM BOROSILICATE, HYDROXYETHYL ACRYLATE/SODIUM ACRYLOYLDIMETHYL TAURATE COPOLYMER, SQUALANE, POLYSORBATE 60, POLYETHYLENE TEREPHTHALATE, CAPRYLYL GLYCOL, HEXYLENE GLYCOL, PHENOXYETHANOL, GLYCERIN, TRIETHANOLAMINE, CARBOMER, SILICA. (+/-) TITANIUM DIOXIDE (CI 77891), TIN OXIDE (CI 77861). If you ask us, there’s no such thing as too much glitter—so we turn to this super-shiny liquid eye shadow time and time again. 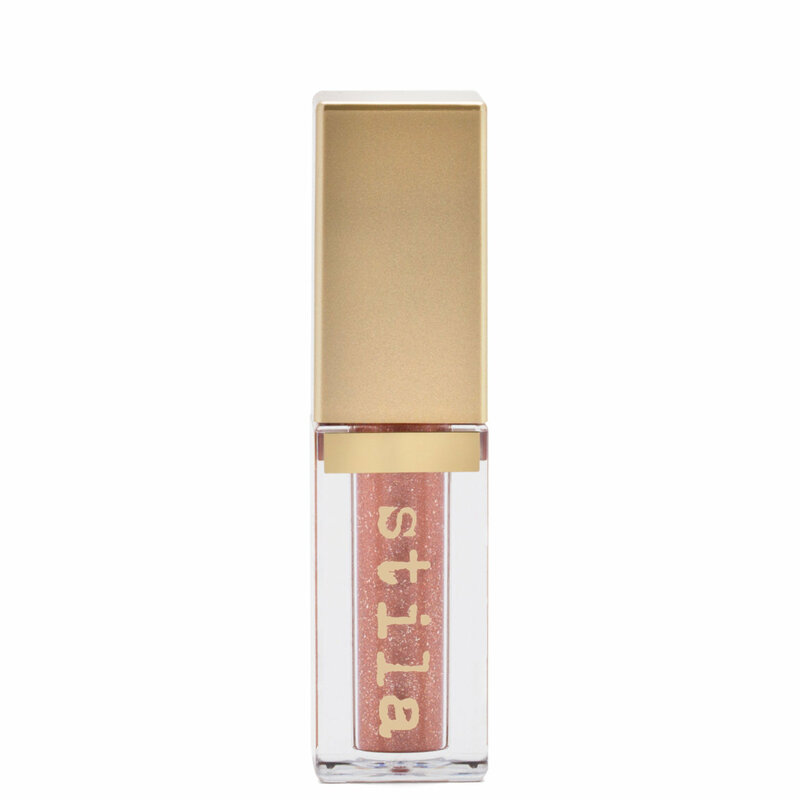 With just a flick of the wand applicator, Glitter & Glow Liquid Eye Shadow coats lids in incredible luster and shine. Unlike loose glitter, there’s no flaking or fallout—once it dries down, it locks into place until you take it off. Use the wand applicator to apply one coat over your lids. Use your finger or an eye shadow brush to blend the edges as the shadow sets. See our easy tutorial to learn how to create a shimmery smoky eye. I absolutely love this product! It's so sparkly and doesn't cease. Easy to apply as well. This shade has a silver liquid base with gold, blue, green and pink reflects. It is a beautiful, nuanced colour and is the perfect glittery eyeshadow topper for special occasions. The glitter is very fine and comes off easily with Bioderma; it does not feel gritty/abrasive against the skin at all and the removal is fuss free. The finished look is sophisticated and not over-the-top. I didn't touch or rub my eyelids at all and it lasted well through the night on my lids without any fall out. These were a little intimidating for me. I was nervous it wasn't going to blend easily and the glitter would look like a mess on my eye but that wasn't the case at all. The applicator makes it easy to precisely apply the glitter directly to the eyelid and it's easy to blend out wet or dry. 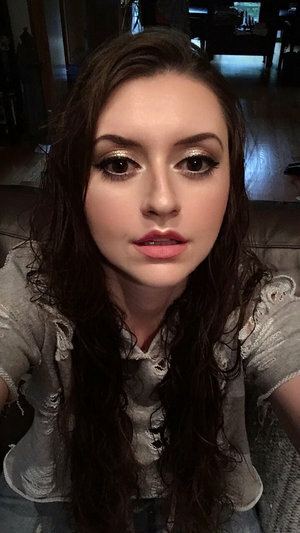 I normally don't wear glitter for a normal makeup application, whether its going out or everyday, because either there is a ton of fallout, it's hard to apply or you have to apply a glitter glue under. 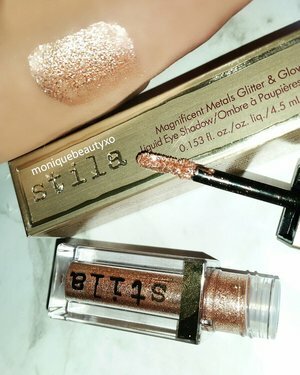 These Stila liquid eye shadows have changed the glitter game! The shadow is so pigmented, and gives the most beautiful glitter to your eye! There is a bit of fallout after a couple hours, but nothing that compares to other glitter eye shadows. You can also blend these out seamlessly unlike other liquid shadows or if you were applying glitter with glue. 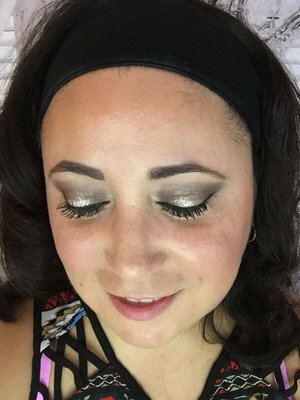 I was a little hesitant at first to give these eyeshadows a try only because I've read a lot of mixed reviews, but when it comes to glitter and metallics well those are some of my favorite things! this color in diamond dust is absolutely beautiful, it legitly looks like I have crushed diamonds on my eyelids. the doe foot applicator is quite unique for applying the Shadows. I recommend only using and eyeshadow primer underneath rather than and eyeshadow itself, I then take the doe foot applicator and Pat my eyelids layer by layer until I get the desired effect, I fan my eyes a bit and make sure that the product is dry. 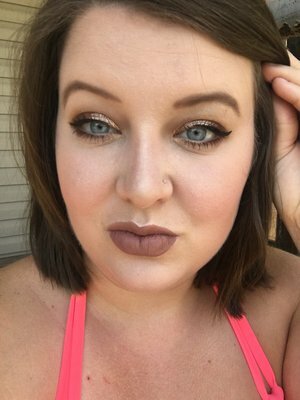 once the product is dry there is very little fall out and they last a very long time, it takes me about 10 hours from start to finish on a work day before I remove my makeup and these Shadows do not budge. I also suggest doing your eyes first and then your foundation because with some of the shades there is just a bit of fall out during the application process. you can incorporate the Shadows with regular powder shadows in your crease for transitioning Etc, I personally do Mike crease after I've applied these to my lid because like I said once they dry they do not budge. some shades however stand out more than others, like this shade here I'm reviewing diamond dust, another shade called next to notte, as for Shades like the texture of in a frenzy is more of just a metallic Shadow with less glitter. I have a few more of these to try out so I will be reviewing each one as I go. overall Stila really hit a homerun with these products they are absolutely beautiful and very easy to use, I plan to eventually get them all just to see the difference in textures!! There is a tiny bit of fall out after a few hours of wear. otherwise it is amazing! Very pigmented and bendable. I have kitten karma, diamond dust, and smoldering satin, and I plan to buy all of them! Extremely pigmented!!! You won't need a glitter glue or a base it just sticks on and lasts all night!!! Love the coulour. 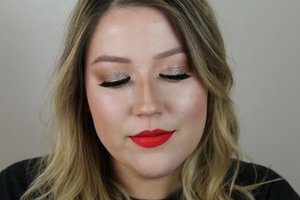 This is the perfect way to bring any eye look from basic to fabulous! The only downfall is once it dries it will flake off if you touch it. I want to get all the shades! I love how this Glitter does not budge after it dries and it give my look a boost of Glam. I would highly recommend the Stila Glitter Eyeshadows. They are bomb!!! !